We’ve been working hard the last few days running around writing, recording, videoing and photographing. At the same time we’ve been trying to reach out online to as many bloggers / twitterers / social networkers etc we could find at the festival or in the local vicinity. Well, we’d love to take a break for a while tomorrow and meet you! From 2pm on Saturday Patrick, Paul and I will be sitting down in Lynch’s Bakery on Church Street (just off the Square). Walk through the door and turn right past the counter into the old bar. You’ll be able to spot us by the amount of technology sitting on the table in front of us. Please come and say hello, have a cup of tea and a chat. There’s no agenda, no formality. Just a drop in, rest your feet, something to eat and/or drink and good conversation. Hope you can make it, and we look forward to meeting you. Just came across these on YouTube. Whoever put them up, thanks and hope you don’t mind we’ve featured them here. 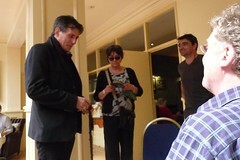 If you look closely at the first one, you can make out Gabriel Byrne and John B’s son, Billy, watching intently. The second one is hysterical! Last night, as part of the literary pub crawl, Abbeyfeale Drama Group performed a number of short vignettes around the town. Here is one that we captured. A quick sweep around to the Seanchaî Literary and Cultural Centre to catch artist Deborah Donnelly‘s new exhibition, “The Farmyard”. 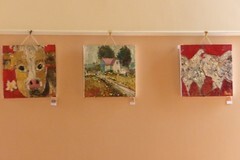 Deborah is based in Dublin and has been painting for nine years. 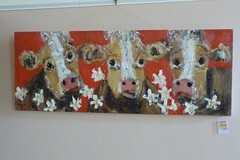 She began painting whilst working with cattle and her love of cows has clearly not diminished since! I’m no art critic but my take is that her pictures are vibrant, brash, full of energy and full of the humour of the subject(s). 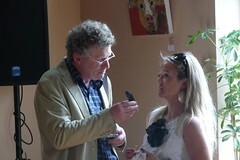 Paul managed to grab a few words with Deborah. We’ll endeavour to get that interview up online as soon as possible. So there we were, interviewing Joseph O’Neill (bear with us on the audio snippets, we’re working to get them up asap) when who should walk past but actor Gabriel Byrne – who opened the festival last night. 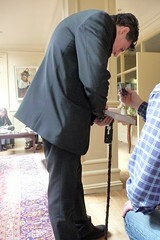 In his hand he had a walking stick. But not just any stick. This one belonged to no other than Listowel deity John B Keane and had just been handed to Gabriel by John’s son, Billy. For a second there was quiet, as everyone comprehended the enormity of this gift. Then Gabriel reminisced about evenings past spent in John B’s pub supping pints with the great man. 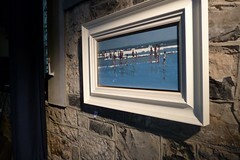 John is a Dublin born, Limerick based (but only just over the border in Abbeyfeale), mainly self-taught painter. 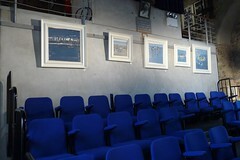 He’s showing a selection of his paintings at St John’s Theatre and Arts Centre until the end of June. 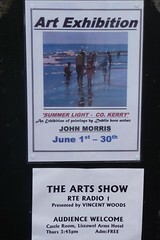 I’d recommend a look around (did I mention its free entry?!). Almost forgot. plenty more information on John’s website.